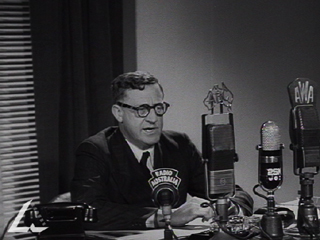 Video clip synopsis – Australians tune in to a radio address from Immigration Minister Arthur Caldwell in 1949. Liz Jacka describes how the world opened up for SBS' audience through its early broadcasts. Broadband MP4 ethnicbroadcasting_bb.mp4 (9.4MB), suitable for iPods and computer downloads. This video clip is an excerpt from Tomorrow’s Australians, an episode from the series Australian Diary, produced in 1949 by the National Film Board for the Department of Information. This video clip is on the From Wireless to Web website, produced in 2005.
outline the important developments in a key event/issue relating to the chosen study. Between 1945 and 1975 nearly four million people migrated to Australia. The trigger for this large-scale migration was the end of World War II, and many were displaced people fleeing war-torn Europe. As the number of new arrivals increased, Australia’s 'ethnic’ communities criticised the 'Anglo-centricity’ of the broadcast media, especially the 'national broadcaster’, the ABC. Many migrants felt Australian radio and television did not cater to audiences from non-English-speaking backgrounds. In 1975, two small radio stations – 2EA in Sydney and 3EA in Melbourne – began broadcasting four hours a day in seven and eight languages respectively. Initially established to inform migrant communities about the newly introduced Medibank health system, the service gradually expanded. In 1977 the Broadcasting and Television Act was changed to provide for the establishment of a national Special Broadcasting Service (SBS) with multilingual radio and television services. SBS Television went to air on Friday 24 October 1980. The first program screened by SBS was a documentary by Peter Luck about the history of Australian immigration. In its early days SBS was available only in Sydney and Melbourne, cities with large numbers of non-English-speaking migrants. Since then, SBS has extended its service to other State capital cities and some regional centres. SBS policy dictated that half the scheduled programs should be conducted in a language other than English. SBS Radio broadcasts in English and 67 other languages, the major languages spoken at home by millions of Australians, including for example, Italian, Greek, Turkish, Vietnamese, Romanian, Slovenian, Tongan, Welsh, Yiddish, Urdu, Bosnian, Bengali and Assyrian, as well as Australia’s Indigenous languages. Carry out a survey to find out the ethnic background of the people in your class. Find out how long their family or ancestors have been in Australia. Using this information, create a set of posters that shows the history of everyone in your class. Find out more about the history of immigration to Australia by following the link below. Use this information and your own research to create a timeline showing how patterns of migration to Australia have changed since World War 2. Explain the impact of changing patterns of migration on the Australian media. According to Liz Jacka, how has SBS changed over time? If you were an historian studying the changing rights and freedoms of migrants in Australia, what would you learn from the interviews in this digital resource?